Since 1994, we have been advising owners of public and private works on the challenges raised at every stage of their building projects. Property has become a financial and strategic reality for companies seeking to evolve, and is one of the main expenses facing companies today. Athegram draws up various optimisation and development scenarios that will allow you to have a short-, medium- and long-term vision and strategy. Our clear and legible tools will provide you with all the information essential to your decision-making: financial estimates, planning, recommendations for implementation, constraints, etc. Athegram combines this strategic approach with the financial and operational aspects of your building project in order to provide you with relevant advice, thereby contributing directly to your company’s performance. Our knowledge of the field as well as regional and national actors enable us to provide you with support throughout the decision-making process. Athegram can assist any company, whether public or private, and irrespective of size, geographical location, sector of activity and the challenges they face. The master plan provides you with a window to the future by responding to your requirements in terms of surface areas and functionalities. The result is a coherent organisation of functions in spaces that are estimated on the basis of substantiated ratios, and the simultaneous definition of the operations to be implemented. The ultimate aim is to achieve the enduring valuation of one or more building assets. By providing you with a master plan, we can simulate the financial, organisational, surface area and scheduling consequences of the various building development options in the medium and long term. This tool will support you in your decision-making when you are drawing up the building strategy for your activity. The master plan will set out the guidelines for the long-term layout of a site and the various stages and phasing that will enable the implementation of the work. Site analysis allows you to select or understand the advantages and/or disadvantages of your plot. The analysis rigorously inspects every aspect of the site: urban regulations, construction capacity, networks, urban surroundings, accessibility, displacements, environmental impact, environmental quality, sanitary quality, etc. Site analysis assists you with decision-making and project costing. For project owners who carry out the same type of operation on a recurring basis, we can draw up a reference framework that allows you to understand the requirements and organisation for each equipment type. This service is aimed more specifically at designers and consultancy groups (tender bids, design and development, public-private partnerships, etc.) and at the development stage of projects undergoing preliminary or final design. The board intervenes at various stages: analysis of the programme, highlighting issues, pinpointing functional questions, making comparisons with other similar projects to give the designer greater insight, participation at design meetings, analysis of the plans, etc. The aim is to support the designer or the group in their decision-making with regard to the general design of the project and to ensure all of the project owner’s requirements are incorporated in accordance with the details submitted to the programme. The experience and expertise of the specialised project managers ensure that responses addressing contemporary design standards will be provided. The pre-programme is the foundation for any building project. It defines the profile of the project by setting out the functional aspects, surface areas, the technical guidelines and the cost. This is the tool that the project owner uses to decide whether or not to go ahead with the project or if any changes need to be made to it. Consequently it is, in most cases, underpinned by the scenarios that constitute the ins and outs of an operation. Once the project owner has come to a decision, the functional aspects need to be specified and the programme needs to focus on the technical aspects. The detailed technical programme will be used as a reference framework by the project owner’s team of architects and engineers, and by the builder. It constitutes the specifications for the builder. The programme is drawn up in close collaboration with the project owner’s representatives to ensure the coherence and sustainability of the operation. Whatever the type of consultancy services required (tender bids, design and development, public-private partnerships, etc. ), we will assist the project owner in analysing the projects or bids across all aspects (functioning, urban regulations, surface areas, technical aspects, environment, budget, etc.). We will then work alongside the project owner to select the winning bid and draw up the contract. At the start-up of the project, we pinpoint the different contractual arrangements that may be possible (project owner consultancy services, design and development, design-development-operation-maintenance, public-private partnerships, etc.). We analyse a range of criteria to ensure that you can make the most appropriate decision for your project. Thereafter, we will assist you in drafting the contracts and setting up the contracting procedures. We take care of every stage of your building project, from the initial programme all the way through until the building enters service, and including overseeing the works. We will assist you in your dealings with all of the people involved in the operation (diagnostician, project manager, health and safety coordinator, technical supervisor, fire safety coordinator, civil engineering companies, scheduling, overseeing and coordination, etc.). At each stage, we will handle liaison between the various providers of intellectual services and communications with the institutions, concessionaires, funders and instructors. We will also ensure that the programme, schedule and budget are strictly adhered to. To better respond to your needs, athegram offers tailor-made and turnkey solutions with adapted contracts : technical assistance to the project owner, operations management, delegated project management or power of attorney. Our operations management tasks include assisting you with administrative, technical and financial aspects of your project. We take complete charge of handling your operations, including facilitating and advising you at every step of the way and while work is ongoing. As the project owner’s proxy or substitute we act ‘in the name and on behalf of’ the project owner. We therefore sign your procurements and payment orders and look after day-to-day decision-making. We represent you before the various people involved and consult with you for every important decision (e.g. approval of studies, selection of actors, decisions affecting budget, schedules, the programme and the project). Optimisation and good use of space are essential for any company. You do not have to have extra space for your business to progress. What you do need is the ability to stand back and consider your current circumstances (space and organisation) objectively. We can carry out an optimisation study for you on a variety of scales, e.g. a single floor, a whole building or an entire site, in line with your specific organisational requirements and budget constraints. The study will be carried out taking into account different time frames – short, medium and long term. Space planning consists of designing the optimal layout for work spaces, such as individual or shared offices, open-plan offices, meeting rooms, reception areas and corridors and passageways. It lets you organise and lay out all the spaces on plans, taking into account all the various components of the work environment. A key step in any company’s relocation project, space planning can, in itself, be the crux of an operation’s success or failure. What matters is achieving optimal occupancy of spaces, ensuring that the organisation and layout of the facility are perfectly adapted to the user’s needs. Change management involves the combination of methods, techniques and means that will be used to monitor and follow through on changes to ensure the best possible chance of success and to achieve the desired outcome as quickly as possible. Change management is crucial to the success of a project and the implementation of a company’s development strategy. It ensures that the expected benefit of the changes made will actually be achieved in favourable circumstances. Micro-siting ensures compatibility between the project premises, the building and the fittings and furnishings. It enables an assessment to be made in respect of the suitability of the site for the intended fittings and furnishings, the ergonomics of the work spaces and any processes, and to chart the various interfaces between the building and the equipment. The equipment / building interfaces in respect of connections, distribution and junctions. Based on the project owner’s expectations, athegram can complete micro-siting with assistance in drawing up an equipment purchasing plan, as well as the actual purchase and reception of the goods. Relocation engineering encompasses the entire relocation process in all of its various aspects: social, functional, technical, economic and scheduling. It is a speciality that combines the necessary experience and expertise to ensure that the relocation can be carried out in optimal conditions. Acceptance of services and settling of any disputes. Our auditing and technical assessment services, for one or more buildings, allow us to give our clients a clear understanding of the condition of their building, both in technical and regulatory terms, at any given moment. The aim is to enable the technical and regulatory aspects that will be of relevance to the design and/or restructuring work to be taken into account during post-study processes. These documents will also serve as the starting point from which to adapt improved energy performance to the building’s existing particularities and optimise the investment. Production of a document summarising the estimated budgets for the works. Technical assistance on behalf of project owners during the design and development stages. Where economics are concerned, we bring our expertise to bear in assisting with the three preceding aspects. including construction costs, intellectual services, removals, furniture, operating and maintenance, etc. by conducting a comprehensive and strategic analysis of your assets and their potential development, as regards their environmental footprint. A multi-disciplinary team trained in architecture, engineering, urbanism, economics and operations management. Our skills are the accumulated result of our experience and our stringent quality standards that we bring to every one of our projects, whether public or private. 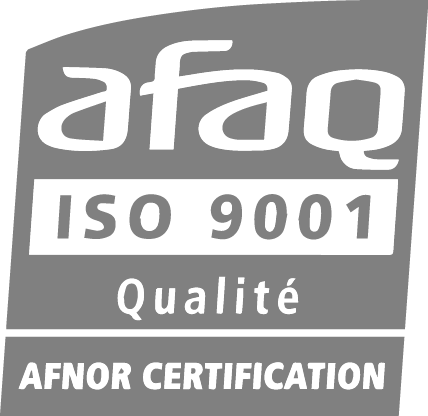 In this respect, athegram has been ISO 9001 certified since 2005, and an independent body carries out a yearly audit. Our quality processes, adhered to by all our regularly trained and audited team members, ensure meticulous attention to detail and the success of our projects. They have additionally been instrumental in creating our extensive ‘athegram’ expertise and have contributed to our in-house culture of continuous improvement. Being organised in this way means we are able to better respond to our clients’ expectations, ensure we fulfil our commitments, and enhance our skills, bringing considerable added value to our professions.